Thank you so much, Jackie, for spending all the time you did with choosing the right color thread. Most importantly, I appreciate the great skill you have in knowing how large or small to do the quilting, so everything is balanced. 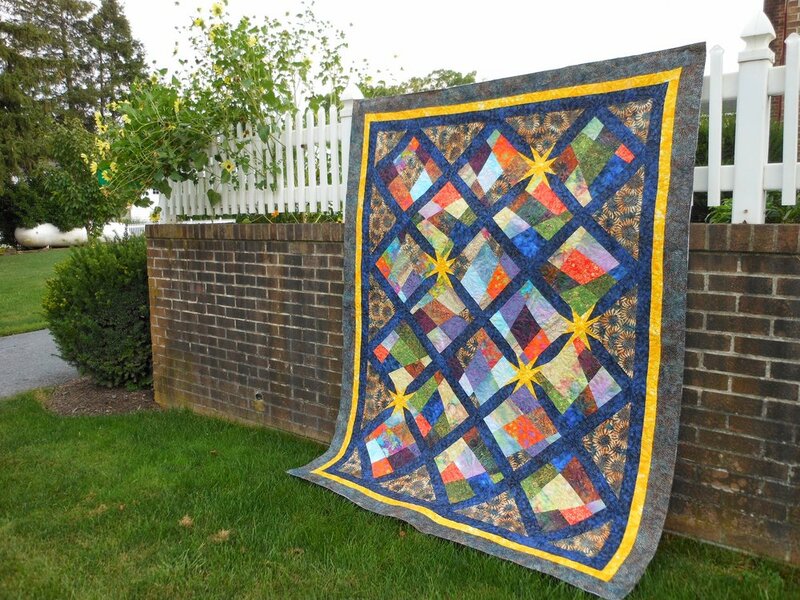 You have encouraged me to find time, outside of my business, to continue to make quilts that make me happy. Thank you so much. When I looked at this quilt pattern the stars instantly grabbed my attention. It made me think of the great energy required in creating the universe. That is the reason I chose to use batiks throughout the quilt. They highlight all the slight variations we see in everyday life. The challenge I experienced with this quilt was the back. I had one fabric for the center which in my option had to be used, but there was not enough. Thanks to Jackie’s wonderful suggestion, I was able to design a reversible quilt, using two additional fabrics that complement front and back.